We are delighted that the Centers for Disease Control (CDC) is spending $880,000 over the next three years in Colorado, Hawaii, Kentucky, Montana and New Mexico to develop registries for children and pregnant women enrolled in Medicaid. This program will enable providers and state agencies to track the immunizations of infants and pregnant women, in an effort to boost vaccination rates across the country. Twenty percent of children see multiple providers before the age of two, which leads to gaps in their medical records, mostly because different parts of the U.S. health care system do not talk to each other. Children might get vaccinated at a clinic, their school, their physician’s office, or a hospital. The CDC has recognized that we need a more unified way for providers to communicate with each other and this three-year grant is trying to create that. This is especially important since, nationally, Medicaid covers over 50 percent of births and 35.4 million children. During the 2016-2017 flu season, under 50 percent of pregnant women on public insurance received the flu vaccine, compared to the nearly 60 percent of expecting women with other forms of insurance. Data also show that immunization rates are much lower for low-income people than the rest of the population, which can have life-long negative effects on the low-income kids. Until Medicaid has the resources to monitor all children with records from their medical home and work with their parents or guardians to ensure they are vaccinated, kids will not receive the requisite vaccinations they need. Through the federally funded Vaccines for Children (VFC) program, Medicaid provides vaccines at no cost to children who are enrolled in the program who are uninsured, underinsured, or Native American through the age of 18. The CDC buys vaccines at a discounted rate and distributes them to grantees, who provide them to private physicians and public health clinics registered as VFC providers. 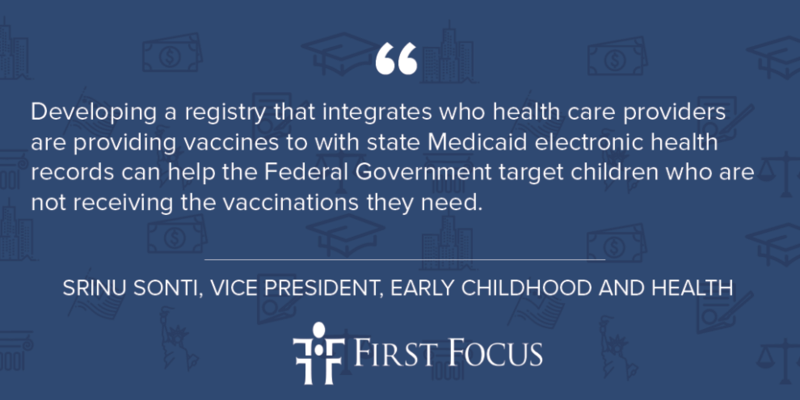 Developing a registry that integrates who health care providers are providing vaccines to with state Medicaid electronic health records can help the Federal Government target children who are not receiving the vaccinations they need. First Focus applauds this initiative by the CDC and encourages the administration to provide additional funds to more states in order to help develop registries, which will ultimately improve the health outcomes of vulnerable children and pregnant women.